This stalwart soldier unleashes attacks that lower strength and defense of all attributes. Prove yourself a worthy opponent with plenty of preparation! 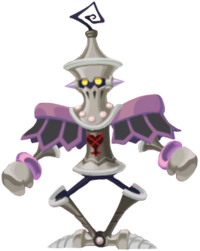 The Piercing Knight is a Heartless that appeared in Kingdom Hearts Union χ.